Looking for Career in Real Estate? Click the form below to hear more about what CARA Realtors has to offer! As a Real Estate Professional who grew up, currently lives and works in Brick Township, I often get asked the question by my clients “What is there to like about Brick?” Funny, as someone who grew up here and loves the town, this used to make me feel defensive, like I had to defend the towns honor. However, it actually has made me think, why do I like living in Brick? On a personal level, I moved to this town in 1st grade and attended Lanes Mill School. I grew up on “the state streets” and could see the basketball and tennis courts of Colorado Park from my front lawn. As a kid, we lived in that park. We played baseball, football, basketball, we had a huge playground and the woods to go explore. My neighborhood was FULL of kids of different ages. You could always jump on your bike and find something to do. As a young boy, I played baseball at Brick American Baseball League with just about every other kid my age that I went to school with. I often remember riding my bike up Lanes Mill Rd to go watch games on days I didn’t have a game. I think it was at Brick American where I learned the true meaning of the word “community”. Often, you would see parents not only volunteering to coach and umpire but you would also see them help clean up and take care of the fields. I remember when it would rain, my father would head up to the field to help get the fields game ready even if my brother and I didn’t have a game to play that day. Seeing so many adults do things so selflessly was something that has always stuck with me and is a reason that I am still a volunteer today. Brick also has its long standing traditions of High School sports. If you were a football player, you grew up wanting to play at Brick High School (Old Brick) for Warren Wolf and if you were a wrestler it was Tony Caravella and Brick Memorial that held your dreams of being a State Champion. The rivalries between the two High Schools were always fun. If you were a Mustang (like I was) beating the Dragons on Thanksgiving was the highlight of your year. As an adult I decided to live in Brick and raise my two boys in the town that I grew up in and loved. Watching them go to the schools, play on the same fields and enjoy the same rivalries as I did has been something I can’t even put into words. What will Brick offer you as a homeowner? Here are just 5 things that I find important. Underrated school system… Recent BOE headlines aside, I think the schools in Brick have some outstanding teachers and I feel like the student has always been given every tool needed to succeed. Recreational Activities for kids… The recreation department in Brick is second to none. They offer something for everyone including two Baseball organizations (1 on each side of town), flag football, tackle football, soccer, basketball, PAL and wrestling just to name a few. Beaches and boating: Brick has their own beach and is a short car ride to Point Pleasant. Want a smaller family type beach? Check out Windward Beach located on Princeton Ave. Have a boat? If you don’t live on the water, you have a few different Marinas to choose from to dock your boat. Local Businesses.. Brick is filled with local businesses and restaurants. We have large retailers, smaller boutique type stores and “Mom and Pop” type stores. Check out the Brick Chamber of Commerce http://www.brickchamber.com/ and I am sure you will be impressed with what you find.
. Brick offers you all the benefits of living at the Jersey Shore and is an hour away from New York City, Atlantic City and Philadelphia. There are many other reasons to call Brick your home. These are just some of the reasons I like to call it mine. To read more about or contact, John Hazelet, please click here. Hello Everyone! Yet again, another beautiful weekend is heading our way! 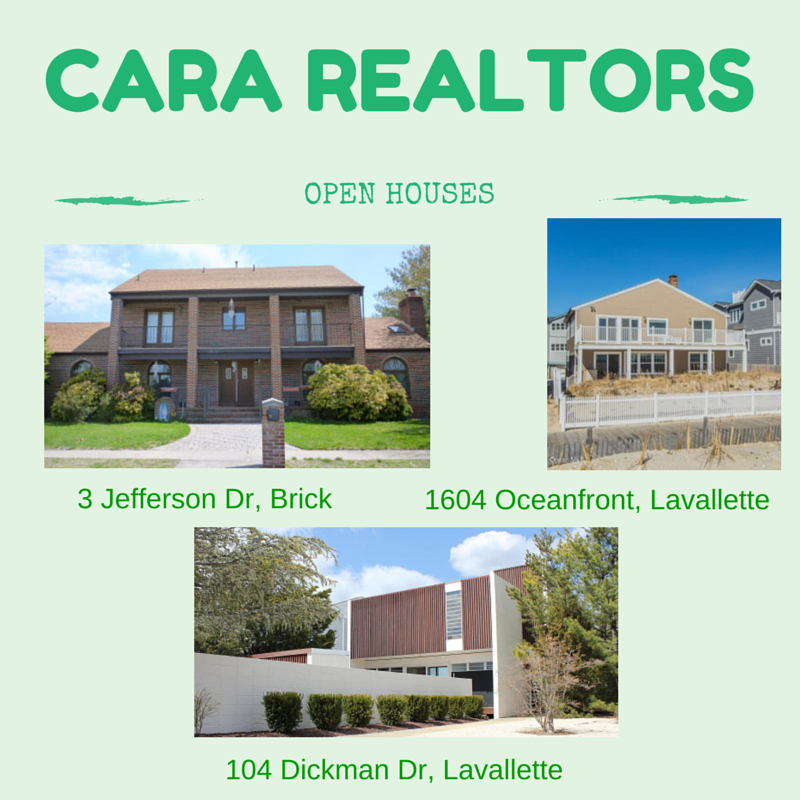 While you are out enjoying the sun, stop by our open houses!